Telehealth is a fast-growing industry, expected to be worth over $34 billion worldwide by 2020. Research shows that consumers have a strong desire to adopt telemedicine. In a national study of over 2,000 consumers, 64% said they would be willing to have a telehealth visit with their doctor via video. In another study by the Society of Participatory Medicine, a staggering 84% believe self-tracking with devices and apps and sharing the results with their health team would help manage their health. While the market seems to be moving toward telehealth, state laws and reimbursement are lagging behind. One of the key obstacles has been that telehealth tools have not provided a way for consumers to conduct an exam from home beyond using audio and video capabilities. TytoCare fills in this “missing link” by enabling comprehensive medical examinations of patients at home that can be conducted in real time with a physician for an immediate diagnosis or by using “examine and forward,” in which the patient captures exam data and sends it to the physician for review. Having medical exam data in addition to a video consult will help optimize reimbursement potential. Below is an overview of the reimbursement landscape as it stands today. The laws and policies are constantly changing, so we recommend visiting the sites below to stay up to date on the latest laws in your state. When submitting a claim for telemedicine, a special modifier must be appended to all codes so that it is clear that the service is conducted via interactive audio and video telecommunication systems. Submit claims for telemedicine services using the appropriate CPT or HCPCS code for the professional service along with the appropriate telemedicine modifier. There are several modifiers that can be used depending on payer guidelines, so it is best to contact specific payers directly to understand their requirements. Until recently, the standard telemedicine modifier was GT, so for example, a new patient consultation that is “via interactive audio and video telecommunications systems” would be submitted as 99201 GT. In 2018, CMS indicated their preference for eliminating the GT modifier in most cases and using the POS code 02 in its place. Separately, the AMA has been promoting the 95 modifier for certain encounters. 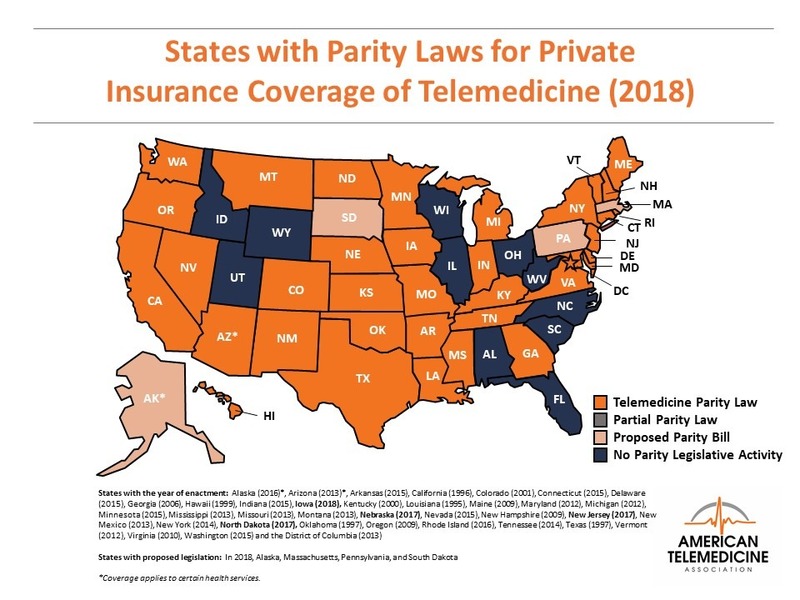 Thirty-three states and the District of Columbia have parity laws that mandate commercial payers provide coverage and reimbursement for telemedicine services as in-person services. Many other insurers cover at least some telehealth services. Insurers are starting to recognize the benefits of reimbursement for telehealth, in some cases going beyond the parity law in their state. For example, IBC (Independent Blue Cross) allows for telehealth visits in Pennsylvania, a state where no parity law exists. Some parity legislation recognizes the importance of exam tools that can replicate in-person visits; Virginia, for instance, mandates exam replication in order to prescribe remotely. Solutions like TytoCare that enable a comprehensive home examination show promise for facilitating reimbursement for healthcare visits in the future. Approximately 49 million Americans are enrolled in Medicare. Many telehealth services, such as remote radiology, pathology, and some cardiology, are covered simply as physician services. For traditional fee-for-service, benefits are based on “originating site” restrictions and apply only to those living in rural areas. In these cases, Medicare covers physician services as long as they use videoconferencing. To check eligibility based on location, visit the eligibility page of the Health Resources & Services Administration. Distant Site Practitioners may also receive payment for covered telehealth services (subject to state law) if they are physicians, nurses, PAs, nurse midwives, clinical nurse specialists, certified registered nurse anaesthetists, dietitians or nutrition professionals, and clinical psychologists and social workers (with some restrictions). Although Medicare fee-for-service beneficiaries are limited, primarily due to originating site restrictions, there are approximately 14 million Medicare Advantage (managed care) enrollees who have complete flexibility in using telehealth as long as their provider offers the service. Many commercial plans have added telemedicine as a supplemental benefit, realizing the clear value and benefit that exist for the Medicare population, showing a trend in the right direction for the telehealth market. In a very exciting and important development, starting in 2019, following the release of the 2019 Physician Fee Schedule final rule, CMS/Medicare has indicated it will cover additional telehealth use cases. In addition to expanding remote patient monitoring (RPM) services, CMS will cover store-and-forward telemedicine, e-consults, virtual check-ins, urban and rural tele-stroke, urban and rural substance use disorder services, and home visits for dialysis patients. Of particular interest for prescribers seeking to implement telehealth in the home, the new RPM coverage is not subject to the traditional Medicare telehealth geographic and originating site restrictions. Changes to the fee schedule can be viewed here. Medicaid is America’s largest medical and health-related funding source for the poor. Though the program is jointly funded by federal and state governments, the federal government allows each state to set many features for their programs. States may reimburse for telehealth under Medicaid so long as the service satisfies federal requirements of efficiency, economy, and quality of care. Extensive control is given to states to decide how to structure and administer their Medicaid telehealth policy. Unfortunately, no two states are alike in how telehealth is actually defined and regulated. These differences create a confusing environment for those using telehealth, particularly healthcare systems that provide care in multiple states. Learn more about Medicaid’s telemedicine policies at or visit the National Telehealth Policy Resource Center to search for Medicaid coverage in your state.